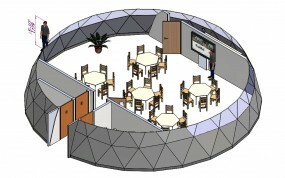 The SOLARDOME® PRO system offers an impressive design alternative to a traditional freestanding classroom or school buildings. The system enables us to produce bespoke geodesic domes up to 25m diameter. With no internal structures or deep foundations, they can be built quickly and cost effectively and designed to suit your exact requirements and budget. They can be clad with any type of material and can incorporate single glazed, double glazed, opaque and insulated panels into the design. There is scope to include extra floors, mezzanine levels, internal rooms and even specify the height and profile of the dome. We offer a full project management service from concept to completion and have proven experience of working in the educational sector. The innovative system is ideal for any educational project where you need extra space and as well as creating a striking design feature for the school, will also inspire and motivate pupils. When you are looking for additional space, don’t just think portakabins or bricks and mortar. Create something truly unique that can be customised to your exact requirements.